Hearts On Fire Necklaces are loaded with well-cut diamonds specifically shaped to reflect the light onto your face and neck. 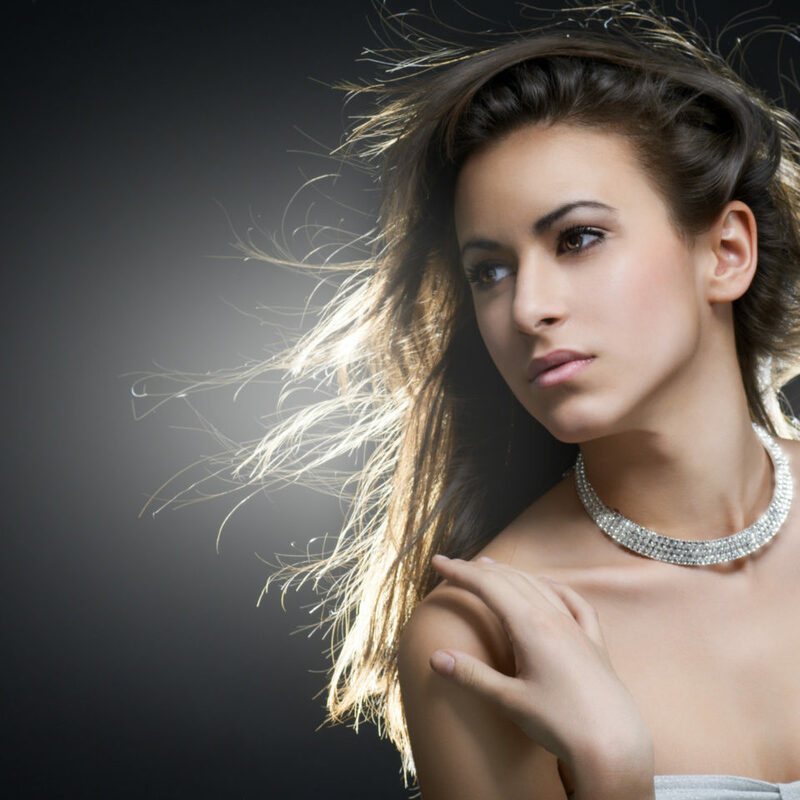 This jewelry collection includes several true showstoppers. 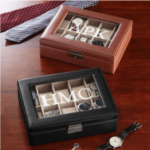 These luxury pieces will draw attention at a formal evening party like a bolt of lightening in a dark night sky. When Rihanna shot the music video for Calvin Harris’ latest hit, “This Is What You Came For,” she wore this Hearts On Fire Necklace in every scene – an especially appropriate choice given the lyrics. 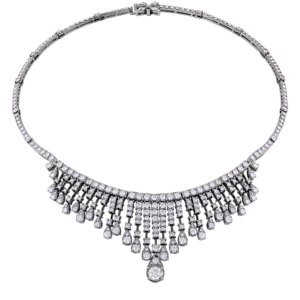 “Lightning strikes every time she moves… and everybody’s watching her… but she’s looking at you.” Rihanna sings this line over and over throughout this enchanting song as the diamonds around her neck flash from the lighting effects. 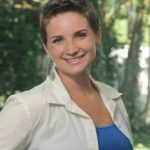 If you want to make it seem like lightning strikes every time YOU move, you should wear a diamond-encrusted Hearts On Fire necklace like the one shown in the photo. I picked out a handful of my favorite Hearts On Fire Necklaces that REALLY SPARKLE! These necklaces are a perfect choice to accompany a formal gown at a special, fancy event… whether you’re going on a dinner date with that special someone, or dressing up to be the guest of honor at a party. Lighting will most definitely strike. 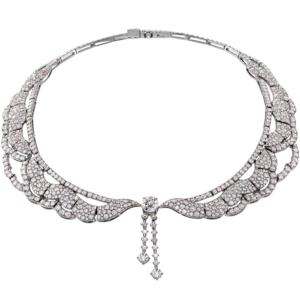 38 carats of perfectly cut white diamonds are set into this beautifully sculpted white gold collar necklace. This design is an exquisite choice to wear with a strapless gown or structured neckline. 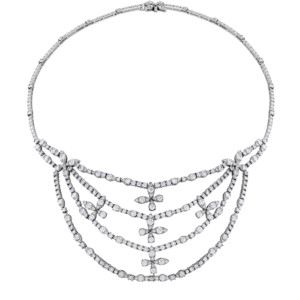 This fashion-forward piece holds strands of 18.25-carat diamonds that hang down in a tiered fringe design. 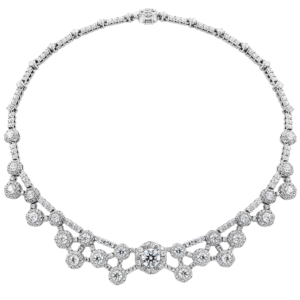 This sophisticated 18k White Gold lace collar is topped off with sparkly white diamonds set at every intersection. Layers of dainty diamond strands with butterfly shapes playfully scattered around, this sparkly necklace showcases a total of 17-carat diamonds. Splurge on some Sparkle with a Hearts Of Fire Necklace! Whether you have to beg, borrow or steal, take your look to the next level with a sparkly diamond necklace like the ones featured here. You will look and feel absolutely luminescent. A statement piece, like the necklace Rihanna wore in her music video, is all you will need to stand out in a crowd. No matter what the forecast is, lightning will strike every time you move.